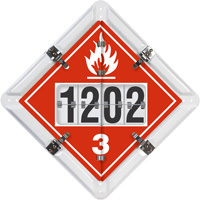 Contents Combustible, Flammable DOT placard flip panels. Simply the Best! DigiLock™ placard sets are the industry’s quality leader. This is the “smoothest flipping” and most durable placard system on the market. • Industry best features include stainless steel clips and heavy-duty aluminum flip sheets. Unlike competitors, we use 24 mil thick aluminum for the digits (versus 17 mil for the others) and our base holder is 32 mil thick (again 33% thicker than the competitors). The placard uses white painted aluminum. • Our edges are polished and smooth – you don’t have to worry about cutting yourself when you install or flip your placard. • The numbers and hazard legends move independently.